With Jigsaw Concepts you get a professional online marketing company coupled with extensive knowledge of the golf industry to ensure your golf website and online presence talks to the right audience. Company owner Dan Sheehan plays of a handicap of +1 and has been in and around the golf industry all his life. This provides unique insight to help you succeed online with the right industry solutions, strategies and terminology that talks directly to your ideal prospects and customers. Web Design – New professional and engaging website or enhancements to your current website. Golf Course Videos – Showcase your golf course with a classy, professional video. Search Engine Optimisation (SEO) – Lead generation, be found online ahead of your competitors. Social Media – Setup and ongoing management to connect with your audience. Online Commerce – Sell online, take online payments, reach new customers. 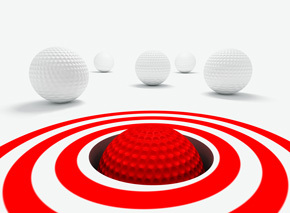 Online Systems – Integrate golf systems into your business / website. 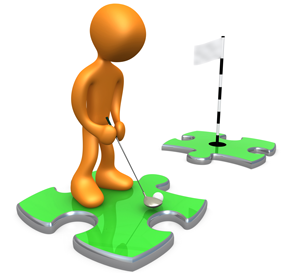 Jigsaw Concepts if a ‘full service’ marketing agency that can take care of all elements of your online golf marketing, giving you piece of mind and the freedom to work on other areas of your business. Golf clubs, courses and country clubs. Driving ranges, pro shops and golf retail outlets. Businesses who offer Golf tours and getaways. Golf organisations, District associations etc. Give us a call today to discuss your golf marketing and website requirements, there’s no obligation and nothing to lose. Call Dan on 0434 002 708 or complete the form below.